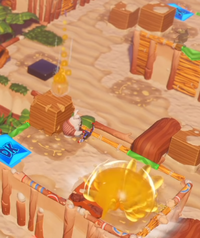 Honeybird Bombing Runs are obstacles that appear in the Donkey Kong Adventure mode of Mario + Rabbids Kingdom Battle. They are obstacles that act on their own turn, during the transition between the heroes' and the enemies' own turns; on their turn, they rain goop down onto the battlefield that can inflict the Honey status. Where exactly an individual ball of goop will land cannot be determined, but they will most likely land right where goop from the previous turn landed. Additionally, the spots they land on are indicated by splotches of goop on the ground so that the player can tell which spots Donkey Kong and co. should avoid. This obstacle is similar to the Pyroclast in the main game. This page was last edited on January 1, 2019, at 18:34.